“By combining the power of Topcon technology with the John Deere track load sensing system, the SmartGrade dozer offers an easy to setup, highly productive grading machine intended for road building, site development and residential building customers," said Liz Quinn, product marketing manager, John Deere WorkSight. "The 700K SmartGrade dozer is a purpose-built machine that is ready to work the moment it leaves the dealership, and the complete system is sold and fully supported by the world-class John Deere dealer network.” The SmartGrade technology enables operators to be more productive on the jobsite. Because SmartGrade is integrated into the 130 hp 700K, it removes the need to install equipment daily, reducing setup time. Eliminating external cables to the masts reduces breakage, and the removal of the masts from the blade eliminates vulnerability to damage and theft. The Auto SmartGrade feature allows the operator to easily adjust the system when moving the machine from one soil type to another, unlike an after-market system, which often requires the GPS manager to make a trip to the machine to recalibrate the system. Especially helpful to new operators, Auto SmartGrade automatically lifts the blade over heavy loads before track slippage occurs, then returns the blade to grade. SmartGrade also limits the number of passes required, reducing the pace of wear on the undercarriage. Machine dimensions are preloaded into the grade control monitor, reducing the time required to calibrate the dozer to about 30 minutes. Additionally, the easy-to-use system is beneficial to new operators in that it can get them up and running quickly. 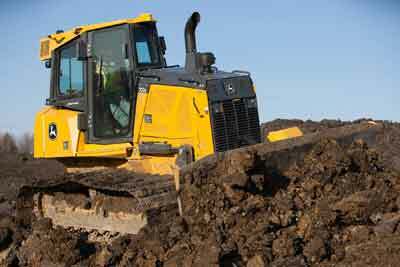 Since the 700K SmartGrade dozer is sold and supported by John Deere, customers can work through their dealer and John Deere Financial to finance their SmartGrade machine and Topcon base stations and rovers, helping to maintain cash flow. The overall return on investment of the Topcon 3D-MC2 Grade Control System is proven in the after-market industry, and the 700K SmartGrade dozer can pay back its purchase price in one to two jobs. Customers looking to get the most out of their 700K SmartGrade dozer can rely on their John Deere dealers to provide Ultimate Uptime featuring John Deere WorkSight. With Ultimate Uptime, owners receive pre-delivery and follow-up inspections; three years of JDLink™ telematics, machine heath prognostics and remote diagnostics, and programming capability; and the ability to add dealer-provided uptime solutions to customize the package to individual needs.